Probably all the famous portrait painters have not once portrayed themselves on the paintings of paintings. For some, a creative path began with this, and someone drew pictures of himself at the very end. 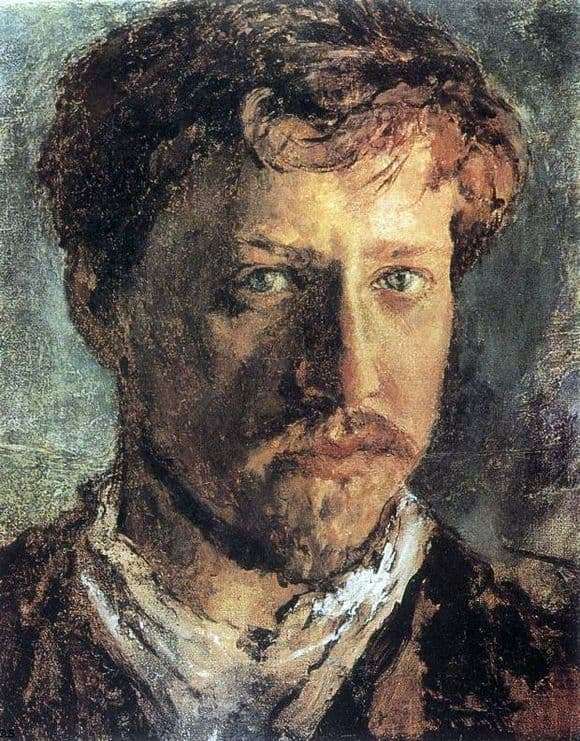 In 1880, with his own self-portrait, he began his creative activity, which gave great promise, the artist Valentin Serov, who was learning to master the art from Repin himself. From birth, he grew up in a family of talented parents, and this played an important role in the development of his artistic abilities. The painting, which depicts a young painter, is painted in oil on canvas. There are no clear lines on it, the image consists of strokes. Greenish gray and light brown shades dominate the color composition. The artist possessed an amazing ability to express the temper and mental state of a person, perhaps that is why he was called a master in portraits. On the canvas, the viewer sees the deep, emerald color of Serov’s eyes, which have an attractive and even somewhat hypnotic effect. His gaze is attentive and focused. The eyes, as you know, are capable of reflecting the essence of the person, and the artist had a very complex and contradictory character. His slightly wavy blond hair falls on the forehead of unruly strands. The artist’s face is framed by a small beard and a mustache line above the lips of the same color as the hair and eyebrows. Light falls on the canvas from the right corner of the picture, it emphasizes the straight and regular line of his nose. Serov’s lips are tightly compressed, which is characteristic of a complex and thoughtful creative person. Writing his own self-portrait was for Serov, in his own way, a personal skill exam. He made a deep analysis of his appearance and reacted to it with criticism.